The delectable New York Strip comes from the strip loin, located in the upper area of the cow’s hindquarter, and is perfect for grilling or pan broiling. It is the continuation of the ribeye moving into the hindquarter between the 12th and 13th rib. With above average marbling (though not as much as the ribeye) and beefy flavor, the New York Strip is one of the most popular cuts of meat. 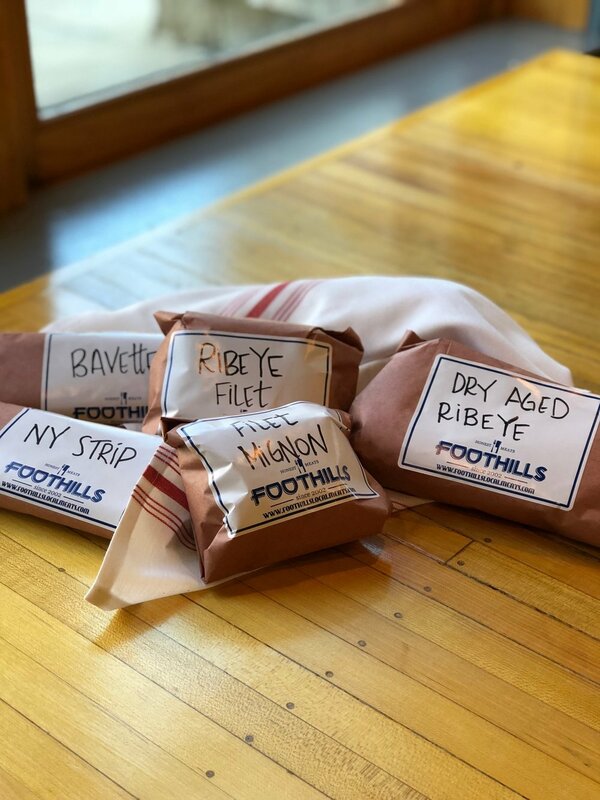 At Foothills, our strip loins are generally split lengthwise down the middle and tied into roasts, one of the more common and savory methods of preparation. Our staff will happily cut these roasts into steaks of desired thickness. A steak cut from a split strip loin is a Strip Filet, or a Petite New York Strip, so technically, it's not a New York Strip unless it’s presented whole. This cut is perfect for the grill or stove, in any season, and is a delightful hearty meal that deserves time and attention to savor it. Pictured: Foothills New York Strip (left) and Ribeye (right). Our Honest Meat Grill Box (Tier 2) features a variety of steaks and cuts (butcher's choice). Marinade: In medium bowl, mix olive oil, Worcestershire sauce, garlic, steak seasoning, red wine vinegar, basil, and Italian seasoning. Pour into a gallon size plastic resealable bag. Pierce steaks on all sides with a fork. Place in bag, seal, and shake gently to coat. Refrigerate steaks for a minimum of 2 hours to marinate. Cook: Preheat charcoal or gas grill to high heat. Place steaks on lightly oiled grill grate and cook for 7 minutes each side, or for length of time to yield desired doneness. Internal temperature for rare is 120 degrees F (49 degrees C). Discard remainder of marinade. Let steak rest for five minutes, then serve to the delight of your dinner companions.